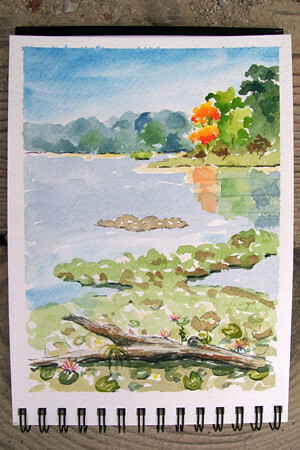 August Sketch Class Results – Let's Paint Nature! 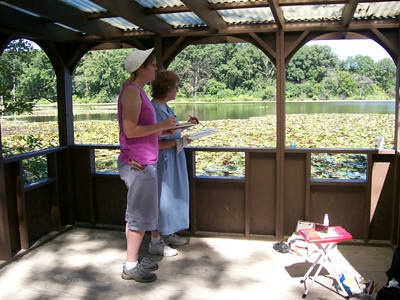 On Saturday August 28th, another successful sketch class was held at the Little Red Schoolhouse Nature Center in Willow Springs, IL. Why was it successful? Not for the size of the class, but for the experience we had; for the beauty we experienced and for nature, which surrounded us and reached out to enrich our soul. 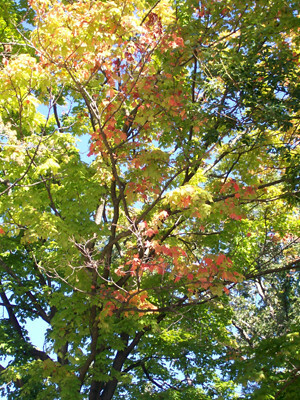 The first thing we noticed was the subtle signs of autumn. Just a few hints here and there, let us know what is about to occur. I can’t wait. Autumn is my favorite time of year. Here is the scene we decided to sketch. What caught our attention was the one single autumn tree across the slough. Sometimes I feel like that little tree, sticking out like a sore thumb, just a little different from the rest. That’s okay, it’s our differences which makes us unique. I’ll tell you a little story…a customer at work regularly picks up his order at my place of employment. He has a very unique and friendly personality and sort of resembles a hippy with long hair. Today, he picked up his order and I didn’t even recognize him, for he cut his hair and was wearing “professional” clothes and looked like every other person that walks through the door. Humf. I sort of miss the unique-ness about him. If it will better his career and he feels good about himself than I will be happy for him. But if he wants to look like every other green tree, than he will get lost in the crowd. Be yourself and be the orange tree. Here we are sketching at the look-out post over Long John Slough. I on the left and Alanna on the right, with brushes in our pockets, we are students of nature. 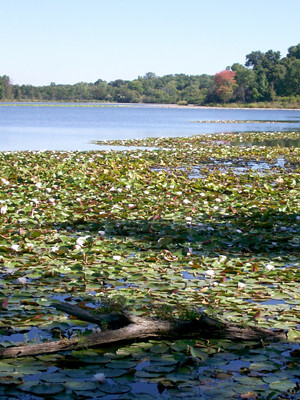 Here is Alanna’s beautiful translation of early autumn on Long John Slough. And here is my interpretation of the “one sticking out”. Hummingbirds (Ruby-throated) feed on the orange jewel weeds as they hover in mid-air. They need to fill up before their long trip back to Mexico and Central America. Busy filling up, they allow us to stand 6 feet away and respectfully watch in awe. 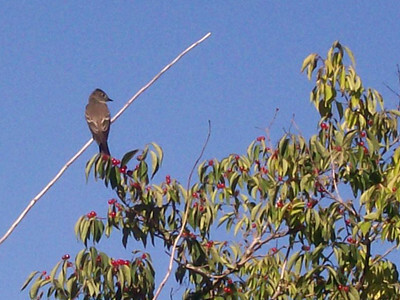 Two Great Crested flycatchers stop above the red berries. They carefully inspect us and quickly fly off. 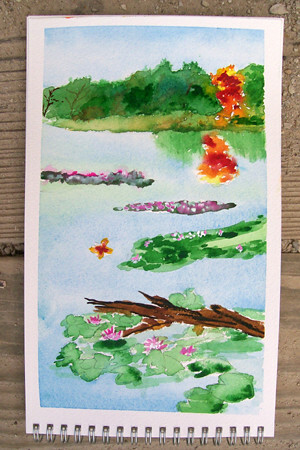 One Swallowtail butterfly flies back and forth above the slough, as a snapping turtle pokes his head above the water. Do you see it has nothing to do with how well we paint, but how much we learn. Here is the Great Crested Flycatcher (Myiarchus crinitus). I am glad to have spotted you before your journey south. I hope you have enjoyed the August sketch class at the Little Red Schoolhouse. Maybe you are at work right now surfing the web and it put a little smile on your face, I’m glad. The next one will be Saturday, September 25th. Perhaps you can join us for this free event? Both “takes” on the lovely scene are beautiful, of course. I also like your advice about being the orange tree. In a similar vein, I once told a friend to always seek out the strangest path. Unfortunately he may have gone a bit overboard with that (he’s become somewhat of a conspiracy theorist,) but he’s still pure at heart. Lana: Thanks! And the “strangest” path sound exciting, your friend sounds like a deep thinker 🙂 nothin’ wrong with that.